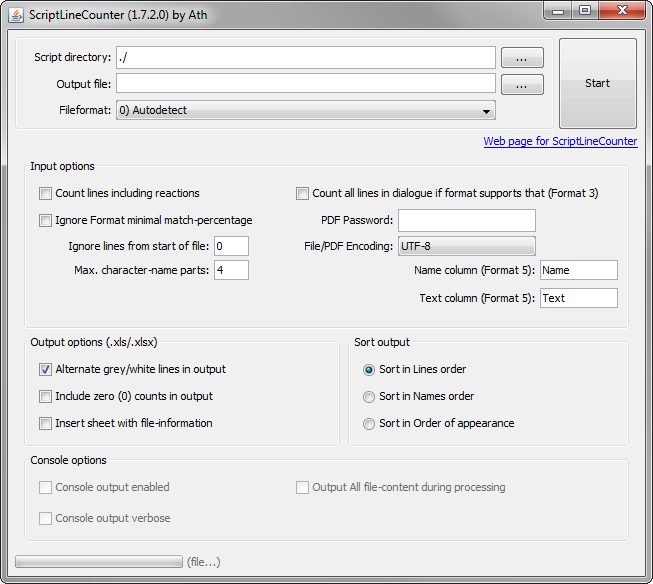 Count all lines of some specifically formatted script files (rtf, doc, docx, txt, pdf, odt, ods, csv), and output all character names and the count of lines/dialogues spoken into an Excel file. Usage and examples can be found in the readme file in the package. 2015-04-17, v1.8.1.0 Fixed: FileFormat5 didn't handle .csv files with semicolon separators, and intermediate output (debug-level 3) for this format lacked new-lines after each line. 2014-03-21, v1.8.0.0 Added: FileFormat6, like FileFormat4 but now allows Character names of 1 or 2 words. This may give some mis-calculations, but is on special request. 2013-06-21, v1.7.2.1 Fixed: Input of Name and Text column name was not transferred correctly to the running instance from the GUI. Improved: GUI layout was a bit stretched. 2013-06-19, v1.7.2.0 Added: Fileformat 5 parameters -cn and -ct now also accept column-numbers instead of a name. First column is 1. Improved: GUI now has fields for Name and Text columns for Fileformat 5. There also the column numbers can be entered. Improved: If debuglevel 3 or greater is set (-3 or -4), the loaded file-content is saved as text to a new file with the same name and '.txt.tmp' appended. Minor: Slightly adjusted some GUI screen-labels. v1.6.0.1 Bugfix: Autodetect fileformat from GUI stopped working. 2012-11-18, v1.6.0.0 Added: New FileFormat nr. 4, based on doc-files supplied by Saira, the original initiator of this tool. note: This format is quite similar to FileFormat 2, so it may need to be forcibly used on some files/filesets. Added: Setting the FileFormat from the commandline using -ff parameter, or set from the ini file, as documented in the readme. Changed: GUI now has the Fileformat combo box enabled, to force a specific file format to be used. Improved: Some more robustness while handling the file contents. Added: A warning in the readme file to NOT use Windows Notepad for editing the properties files, as it inserts a BOM in UTF-8 files, not supported by SLC. 2012-05-07, v1.5.1.0 Improved: Updated POI Library from 3.8-beta6 to 3.8 Release. 2012-03-17, v1.1.0.1 Bugfix to process .doc as intended. Improved episode number/name detection method. 2012-03-17, v1.1.0.0 Process .doc/.docx files, .txt added as a bonus, column titles can be set in .ini file (sample included), improved errorhandling. 2012-03-16, v1.0.0.0 Initial release, processes .rtf files only, output to .xls/.xlsx, command-line only.